Benny Frank Barnes (born April 17, 1938) is an American real estate magnate, politician, and lobbyist, who formerly served as Speaker of the Texas House of Representatives from 1965 to 1969 and the 36th Lieutenant Governor of Texas from January 21, 1969 to January 16, 1973, for two two-year terms. He was a vice-chair and top fund-raiser of John Kerry's presidential campaign. Barnes was one of only eight persons who raised over $500,000 for Kerry. Barnes was born in Gorman in Eastland County, Texas, on April 17, 1938, and named "Benny Frank Barnes". His parents, B.F. Barnes and Ina B. Carrigan, had another son twenty-one months later, Rick Barnes. The family moved to Comanche County, where Barnes graduated in 1956 from De Leon High School in De Leon. After high school, he enrolled for one semester at Texas Christian University in Fort Worth, followed by a semester at Tarleton College in Stephenville, Texas. That spring he married his high school sweetheart, Martha Morgan, and at age twenty began studying at the University of Texas at Austin. Barnes has two children from his first marriage, Greg and Amy. He has four grandchildren: Ashley Mathis, Ben Barnes, II, Kelly Barnes, and Katherine Mathis. 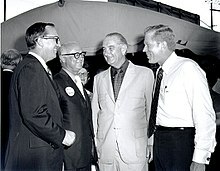 Ben Barnes (on right) with House Speaker Gus F. Mutscher, Governor Preston Smith and former president Lyndon B. Johnson in Brenham, August 17, 1970. While a student at The University of Texas, Barnes worked at the Texas State Health Department. After discovering some financial irregularities that led to the indictment of the state health commissioner, Barnes became interested in politics. He went back to his home area of the state and ran for state representative, when he was barely 21 years old and pulled off an upset victory. Advancing quickly through the Texas legislature, by 1963, Barnes was chairman of the powerful Rules Committee. The U.S. Junior Chamber of Commerce recognized Barnes as one of the "Ten Outstanding Young Men in America" in 1965. Barnes served as state Speaker of the House in Texas from 1965-1969. The position opened when Governor John B. Connally, Jr., named Speaker Byron M. Tunnell to succeed the retiring Ernest O. Thompson on the Texas Railroad Commission. Barnes was chosen by House members to succeed Tunnell and hence became the youngest Speaker in Texas history. He was also U.S. representative to the NATO Conference in 1967, and United Nations Representative to Geneva, Switzerland, in 1968. Barnes served as lieutenant governor from 1969–1973, often called the most powerful position in the Texas state government because the lieutenant governor can block a governor's agenda from being considered by the Texas State Senate. While Speaker of the Texas House of Representatives and later Lieutenant Governor, Barnes alleged he was instrumental in enabling numerous sons of both Democratic and Republican politicians to avoid serving in the Vietnam War, one of them being George W. Bush. Concerning Bush's acceptance, Barnes told CBS News's Dan Rather that he was requested to help George W. Bush by Sid Alger, a friend of both Barnes and then Congressman George H. W. Bush. In a section of the interview not broadcast, Barnes said he didn't know whether his alleged call to Rose "was the absolute reason he got in the Guard. ... Sid Adger, and not the Bush family came to see me, to ask me to get-- President Bush-- George W. Bush into the National Guard, which I made the call to Gen. Rose. And he was accepted. Whether he was accepted solely because of my call, I do not know." Barnes has denied getting any request from George W. Bush or his father for help in joining the Guard, and then Col. Walter Staudt denied receiving any requests to admit Bush..By the time of the Rather interview, Adger and Rose were both dead, and could not confirm or deny Barnes's story. In 1971, Barnes was caught up along with the Democratic Party in Texas in the political fallout of the Sharpstown scandal, though he stated he had no knowledge of the involvement of several state senators and no charges were filed against him. The scandal contributed to an unsuccessful run for governor and Barnes's exit from public office. During the 1970s and 1980s, Barnes developed a multimillion-dollar real estate empire which included the development of such projects as Southwest Parkway and Barton Creek Country Club in Austin. Like his former mentor John Connally, he entered bankruptcy following the collapse of the real estate bubble in the mid-1980s. In the late 1990s, Barnes began working with GTECH Corporation, a company that operated lotteries in 37 states including Texas. Since leaving elective office, Barnes has become a business executive and civic leader. He is the founder of the Ben Barnes Group, a business consulting and lobbying firm. He has served as a consultant, director or chairman of more than two dozen companies, including SBC Communications, American Airlines, Dallas Bank and Trust, Grumman Systems Support Corporation, Laredo National Bank and the Barnes/Connally Partnership. The Ben Barnes Group acts as a go-between, bringing special interest groups and companies together with highly placed Democratic officeholders. The Center for Responsive Politics has listed Barnes as the third largest all-around Democratic donor in America from 1999 to 2004. Among his partners in the Barnes Group is the former State Senator Kent Caperton, who represented Texas Senate District 5 from 1981 to 1991. In 1995, The University of Texas named him a Distinguished Alumnus. In addition to his corporate work, he also serves on the board of several non-profit organizations, including the Boys and Girls Club, the national group Patient Privacy Rights, and is vice-president of the LBJ Foundation. Barnes is the author of the book Barn Burning Barn Building: Tales of a Political Life, From LBJ to George W. Bush and Beyond (ISBN 1-931721-71-8) (with Lisa Dickey), which was first published in 2006. ^ "Kerry Keeping Eye On Big Donors". 18 June 2004. Biography[permanent dead link] from Texas Monthly Talks hosted at the KLRU website. This page was last edited on 27 January 2019, at 08:10 (UTC).